We've said it before and we'll say it again: pay-as-you-go solar is the future for those working beyond the grid. From Pakistan to Kenya, anecdotal reports have trickled in that pay-as-you-go solar finance -- the off-grid solar market's version of a "solar lease" -- is driving record sales. Now, we have one more data point to add to the mounting evidence. Solar market leading d.light, a manufacturer and distributor of solar light and power products that just closed a $11 million series C investment, announced it sold a record 500,000 solar systems. Those systems will serve a record 2.5 million people. This is all thanks to pay-as-you-go financing. This announcement is a confirmation of what many in the off-grid solar market have been saying for quite some time: it's all about unlocking finance. That's why the solar industry continues to demand $500 million from the World Bank in order to catalyze growth. (You can support their call by signing our petition here). Of course with millions flowing into the solar market from a variety of sources, they're not exactly waiting for international financial institutions to make a move. But enterprise financing is just one piece of the puzzle. 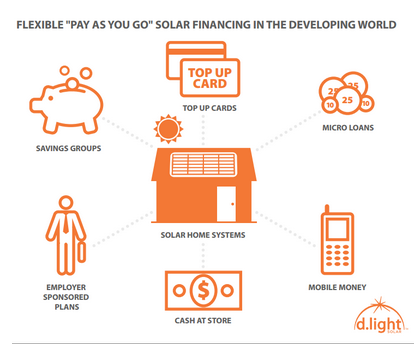 Access to financing for everyday consumers is just as critical to unlock solar for the masses. That's because the upfront costs of solar technology can often times leave these clean off-grid energy products out of reach for many. That's why d.light is doubling down on its success by announcing a new initiative that will focus on integrating advanced product technology and service offerings for a full range of payment systems, including microloans, self-help groups, top-up cards, and mobile money. Making solar financing as easy as possible for customers is the best way to get solar power into their hands. The new initiative, dubbed 'Energy Access Accelerator', will be led by d.light's President, Ned Tozun, and Managing Director of Global Consumer Finance, Sateesh Kumar. Mr. Kumar is a former Executive Vice President of SKS Microfinance, one of the largest public microfinance institutions in the world. And by unlocking consumer finance, that means unlocking this $12 billion solar market. According to Donn Tice, Chairman and CEO of d.light, the "Energy Access Accelerator will be focused on scaling distributed energy solutions. Scale requires a consistent user experience, reliable energy and flexible payment options." With over six million solar products currently being used around the world -- serving an estimated 36 million people -- d.light knows a little something about scale. But until now, pay-as-you-go finance, currently 20 percent of d.light's sales, was a relatively minor arrow in the companies quiver. With this announcement, that's set to change, and it's a potent signal of the emergence of consumer finance in the beyond the grid marketplace.